ALRP’s From the Heart 35th Annual Reception & Auction raised more than $185,000 to support ALRP’s free and low-cost legal services and programs for people living with HIV/AIDS! The Annual Reception, ALRP’s biggest fundraising event of the year, was held on Wednesday, October 17th, 2018 in the Julia Morgan Ballroom at the Merchants Exchange in San Francisco. The event was attended by over 300 guests. During the evening, ALRP recognized its 35 years of achievement and honored those who have made a lasting difference in the lives of people with HIV/AIDS. 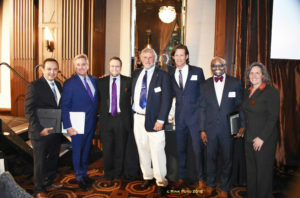 San Francisco City Attorney Dennis Herrera presented the ALRP 2018 Clint Hockenberry Leadership Award to Endy Ukoha-Ajike, Esq., the ALRP 2018 Attorney of the Year Award to John R. Unruh, Esq., and the ALRP 2018 Firm of the Year Award to Nixon Peabody LLP. ALRP received significant sponsorships from leading law firms and organizations including Gilead Sciences, Inc., the Morrison & Foerster Foundation, Jones Day, Kilpatrick Townsend & Stockton LLP, MUFG Union Bank Foundation, Perkins Coie LLP, Pillsbury Winthrop Shaw Pittman LLP, Shartsis Friese LLP, and Wilson Sonsini Goodrich & Rosati Foundation. Additional funds were raised through ALRP’s live and silent auction and through Reception ticket sales. During the Annual Reception, ALRP also held a special appeal to raise funds for its newly launched ALRP Litigation Expenses Fund. Special thanks go out to our event partners: Bizzarros Gala & Event Auctions, Rink Foto, Skona Advertising, Springer Ayeni, and Viszlay Vineyards – and to our reception ticket purchasers, donors, auction item donors and winners, and volunteers. Despite a difficult economic climate for HIV/AIDS fundraising and a 55% increase in its caseload over the last fifteen years, ALRP continues to provide free and sliding scale legal services to over 1,500 people living with HIV/AIDS each year. For more information and photos, visit www.alrp.org. « Fall 2018 CLEs are HERE!